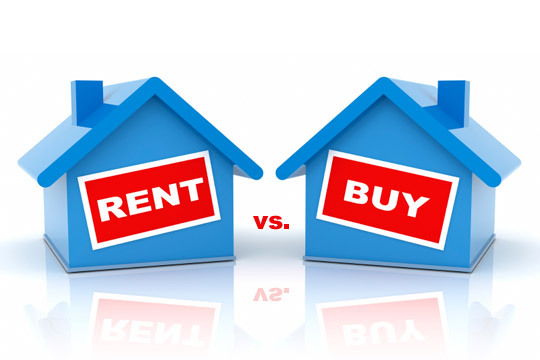 Rent vs. Buy…What does the data shows? A growing percentage of renters believe it is cheaper to rent than to buy a home, which helps explain why the homeownership rate remains persistently low nearly a decade after the housing crash. A boom in apartment construction in the past few years has caused rent increases to begin to level off in many U.S. cities, while home price gains have accelerated over the past year. As a result, roughly 76% of renters in August said they believe renting is more affordable than owning, up from 65% in September 2016, according to survey results from Freddie Mac expected to be released Wednesday. “We talk virtually every day about how renting is becoming less and less affordable. I think the answer is just that housing is becoming less and less affordable and renting is the more affordable of the two,” said David Brickman, executive vice president and head of Freddie Mac Multifamily. The data from the Freddie Mac survey and another by the National Multifamily Housing Council suggest there isn’t likely to be a shift toward owning from renting among old and young alike, due to financial reasons and those of lifestyle and preference. Landlords are likely to see this as welcome news that a widespread shift toward owning isn’t coming anytime soon. The data also indicate the persistent shortage of homes for sale on the single-family side is depressing the appetite for homeownership. In the Freddie Mac survey, the view that renting is more affordable increased significantly across all age groups. Some 76% of millennials said renting is an affordable option, up more than 10 percentage points from a year ago. Roughly 82% of baby boomers said they view renting as a more affordable option, up 11 percentage points from a year ago. And the share of Generation Xers who see renting as more affordable jumped to 75% from 56%. National home prices increased by 5.9% over the year ending in July, according to the S&P CoreLogic Case-Shiller U.S. National Home Price Index. Figures for August are due out next Tuesday. People appear to be aware of how rising home prices are affecting their local markets. Some 58% of respondents for the Freddie Mac survey said they believe home prices are higher than they were a year ago, while 54% said they believe that rents have increased. Two millennials decorating their apartment last month in Minneapolis. The National Multifamily Housing Council survey found that baby boomers might be more likely than millennials to rent to avoid the costs of homeownership, perhaps because they have spent decades repairing broken dishwashers and replacing leaking roofs. “By the time you hit 65 you’re fed up with all those costs,” said Rick Haughey, vice president of industry technology initiatives at the National Multifamily Housing Council. The survey found that just 7% of all renters 25 to 34 years old said they choose not to own a home because of the maintenance costs, while 28% of those over 65 years old cited that as the reason. The top reason renters across all age groups said they prefer to rent was convenience and flexibility, with 23% of respondents citing that as the reason, while 18% said they don’t have enough saved for a down payment. The third most common reason cited was that they had recently moved and are exploring neighborhoods. That suggests the trend toward renting is being driven less by necessity and more by preference and lifestyle, which means it might not reverse anytime soon. The Freddie Mac survey found a marked decline in those who said they are actively working toward homeownership, to 14% in August 2017 from 21% in January 2016. “I don’t see a big demographic shift toward homeownership,” Mr. Brickman said.